Our adventure to Semuc Champey which is close to Coban, Guatemala started on Friday afternoon in Antigua. We loaded into a mini-van and made the 6-hour ride to an awesome weekend. On the mini-van with us were many people from all over the world. Two of them, Lara and Claudia were from Germany. I could tell right away that Claudia had the stereotypical "German attitude". Nothing was sugar-coated with her. I thought her encounters with Becky, a sweet American girl were absolutely hilarious. We arrived at our hotel at around 9 that night. Certainly a no-frills hotel. A small room with two beds which a crappy top mattress that let you feel the wooden boards of the box spring below. We did our routine "BBDB Check" to verify that our beds were surprisingly bedbug-free. BBDB = Bed Bug Dingle Barry. It was so stinking hot and the humidity in our room was so thick you could cut it with a knife. I wasn't able to sleep very well that night. We woke up early the next morning and ate breakfast at this little local restaurant. We had crepes stuffed with lots of fruit that was sprinkled with granola. It was wonderful, but right as I was about to finish off the last few bites, the plate fell into my lap - crepe, fruit and all. It was sad. Our transportation to the beautiful turquoise pools of Semuc Champey was in the bed of a pickup truck. The bed was equipped with shaky rails that we could hang onto. We were crammed in there with a bunch of other Gringos and a few Guatemalans. Many of the Guatemalans were just hanging onto the side of the truck which looked a bit dangerous. But I guess standing up in the bed of a pickup truck is dangerous as well. After traversing up and down a mountain or two, hanging on to the shaky rails for dear life, we finally got to the entrance of the park. We started off by taking a hike to an overlook that gave a beautiful view of the turquoise pools that make Semuc Champey famous. Apparently it's also where the latest Rambo was filmed. I haven't seen it yet, but when I do I'll be on the look out for familiar scenery. We hiked down to the pools and saw a massive river that was pouring into a cave. The river goes underground into a cave for a good distance and then spits out underneath a beautiful waterfall. We swam around in the pools a little while. Lara jumped off a cliff that no one else would. We watched some Guatemalans climb this really tall tree and jump off into the water below. Then we swam/hiked to the waterfall where the underwater river shot out. Our tour guide, Jose whipped out a rope and tied it to a rock. Then he threw the other end of the rope over the waterfall and said, "Vamos!" That means, "Let's go!" As in, "Down the waterfall on this here rope that I tied to a rock." Brave Lara was the first one down the falls. The first part was pretty easy, just kind of repelling down while some water ran over your feet. But about half-way down the waterfall, forceful water is dumping on your head and it becomes much more difficult to focus on where your feet are beneath you. Then the footholds run out and there is a big gap between the last foothold and the ground. Jose was at the bottom to help us get our feet in the right place. No one fell to their death. So that's a good thing. After the whole group had gotten down the waterfall safely, we went under the waterfall where the cave spat out the river. People are able to go into the cave normally, but the force of the water was too strong due to so much rain that we couldn't go into the cave without getting spat right back out into a scary-looking jaggedy-rock laden whirlpool of death. It is Guatemala's rainy season after all. At that point I could have called it a day and would have had the best time in on our trip so far. But the day wasn't over. The pickup truck with shaky rails took us to a river. We were given inner tubes and were told to jump in. The river was freezing cold, but the tube ride was amazing! Jose told us not to get too far off to the left or the right because we'll run into trees and get stuck. He said if we get knocked off the tube by a tree to not hold onto the tree or we would drown. I tried really hard to not run into any trees. 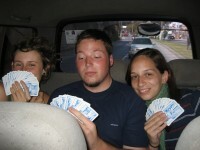 On the ride back to Antigua the next day I played cards with Lara and Claudia while talking in German, Spanish and English (see photo above). Yay for languages and crazy adventures. Yeah the whole repelling from a rock with no foot holes - never would be allowed in America. Thanks for the stories. What was Claudia's encounter with Becky? You left me wondering! Same as Mary A. what were the encounters? @Mary Audrey & @Cody Hough - Well, there wasn't just a single encounter that was noteworthy, but their general interaction was funny. And awkward. @Nomadic Matt - Awesome - thanks!